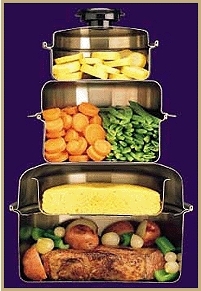 "It's like eating raw vegetables but without the crunch"
Why buy fresh vegetables then boil, steam or microwave them? Only cooking Vacumatically retains all the natural vitamins. The world's most expensive cookware now at factory prices! What is Vacumatic Cookware ? Vacumatic is a process of cooking your vegetables in a vacuum vapor. Other methods, such as steaming, boiling or Microwaving all bring the foods to 100 Celsius / 212 Fahrenheit, which is the temperature where the vitamins, minerals and nutritional goodness break down. When cooking in a vacuum vapor the temperature does not exceed 74 Celsius / 165 Fahrenheit therefore retaining 98% of all the natural vitamins, minerals, colour and taste. Without features such as the vapor seal, vac-control valve, heat conducting inner core that extends up the side your cookware, you cannot cook the proper Waterless way. This heat conducting inner core also offers energy savings, up to 70%, virtually paying for the cookware in a few years. Highest quality 304-T surgical stainless steel with Titanium. Special 'Whistle Vent' to notify you when to turn off the heat. Only use a fraction of electricity, saving you over 70% on hydro. Retains vitamins, minerals, natural colour, flavors and taste. Built to last a lifetime. Full 50 year warranty. No oils or fats needed for frying. Full 7-ply construction along bottom and up the sides. Wipes clean with just warm soapy water. Can 'Stack Cook'. Self storing lids. The only people paying for Vacumatic cookware are the ones who do not own it. Why is Surgical Steel with Titanium Better? The 304 Surgical Stainless Steel contains about 19% chromium and 9% nickel in addition to the iron. The popularity of 304 surgical stainless steel is due to its gleaming appearance which lasts for the life of a product with just an occasional cleaning. The chart below is based on the average percentage of mineral losses for all vegetables from the "University of Wisconsin, Journal of Home Economics, Vol. 17, No.5" *Ref. : Paul R. McCann, Food Specialist, Author of the book "The Science of Nutrition"
Click HERE for list of which food contain what mierals and the health effect. Research on the aging process, like that coming out the US Department of Agriculture Human Nutrition Research Center on Aging at Tufts University, suggests that maximizing the nutritional quality of your diet may slow down or prevent age-related problems that many people think of as inevitable. The studies recommend cooking foods for a short time and in as little water as possible. 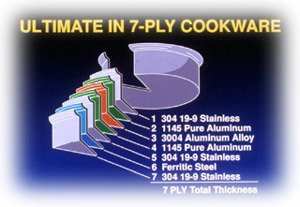 As stated previously, cooking with the waterless method using our 5 or 7 ply cookware retains 98% of the nutrients. Boiling food the old fashioned way destroys an average of 42% of the nutrients. Cooking with waterless cookware is done under a vacuum with economical low heat. Just as the insulation in your house does its job, this cookware saves a lot of money over the years on utility bills. The built-in steam control valve whistles like a tea kettle to let you know when to turn the heat off. The layers allow even heat flow, and durability. The aluminum conducts heat well in the inner layers, but is not desirable on the outside because it corrodes and comes off in the food. 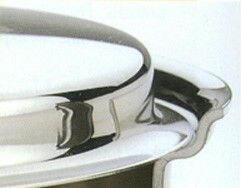 Surgical Stainless steel protects the food and the cookware itself. Stainless steel also contains iron which makes it good for magnetic induction stoves. Warp-Resistant Bottoms The special design of the bottom of each our pots provides extra strength and rigidity that will always prevent warping. The pans stay flat and hug the burner for maximum heating efficiency during the entire cooking process. The handles are oven safe up to 350°. There is no need to ever use under the broiler. The first thing to do before using your new cookware is to wash each piece thoroughly in hot water and detergent, rinse with hot water and dry completely with a towel. This will remove manufacturing oils. After each use, good dishwashing rules are all that are necessary for every day care of your cookware. A blue or golden brown discoloration may appear if you should happen to overheat a unit. You can remove this by using any good stainless steel cleanser. NEVER put cold water into a hot utensil. Heat utensils gradually, NEVER use high heat. Should a lid lock, simply open a steam valve. Always rinse your prepared foods in cold water and drain for a few seconds. Enough water clings to the food to combine with natural juices and cook the food in its own steam. This is waterless, nutritional cooking. For safety, and until you get used to this new method, you should add at least 1/4" of water to the bottom of the pan. To use the steam control valve, start cooking on medium heat (never use high heat). Then, when the valve begins to whistle, close the valve and turn the heat down to low and finish cooking. After you do this, the lid will form an airtight heat seal. Shake pan holding cover tight once during starting time, and once during second period. Continue cooking until done. Season at end of cooking. steam are allowed to escape. This lengthens the cooking time and dries out the food. The time guide below is only a suggestion. Remember that the cooking time depends on the texture you prefer your vegetables to be at meal time. Actual cooking time will vary depending on this fact, as well as on the quantity and size being cooked. The shorter the cooking time, of course, the crisper the vegetable. Carrots (1/2 in. cuts).........10-15 min. 7-ply sets allows you to stack cook. 1. Preheat electric stove top burner to medium heat. 2. Coat your pot evenly with Pam or other cooking spray. 3. Lightly coat your pot with sugar. 4. Pour off excess sugar. 5. Center your pot on your preheated burner. A poor quality pot will start melting in the spot in direct contact with the burner. As you wait for the sugar to melt across the pan, it starts to burn in the "hot spot". Good quality cookware like Vacumatic Waterless Cookware will melt the sugar evenly with no hot spots. 1. Take any of your favorite pots and add a cup of water. 2. Add a teaspoon of baking soda. 4. Take a spoon and taste the water. What does it taste like? Do you still want to eat the food cooked in that pot? Surgical Stainless Steel is not porous like cast iron, aluminum, copper, and other cookware. When you do this test with Vacumatic Waterless Cookware the water tastes like it should, like soda water. This is why surgeons use Surgical Stainless Steel for surgery. It could be the process of your pots gradually corroding, and therefore minuscule particles of your pots being deposited in the foods that you are cooking for your family. By using 304 surgical stainless steel cookware you would never have to worry about what is going into the bodies of your family, and possibly harming their health. The reason for that is that the 304 surgical stainless steel that our cookware is constructed of is corrosion resistant. Most cookware leaches metals from the pot into the food that is cooked in it. Cast iron, aluminum, copper, and no-stick cookware can be a problem. Cast iron pots are so porous you can usually see the grease etc. coming through the bottom of the pan. Can you imagine what is living and growing in your cast iron frying pan? Aluminum has been linked to several diseases. Non-stick cookware has formaldehyde in it. Have you ever used glass cookware? If you have, did you ever notice that the lid is always much darker in color than the pot after years of use? Often glass cookware is used without the lid on it. What has left the glass pot and gone into your food that makes it so much lighter in color than the lid after years of use? The heavy metals that leech from poor quality cookware into your food are not the same as the minerals that your body needs for optimum health. Your body needs iron but iron from an iron pot or frying pan only contributes to heavy metal poisoning and is not healthy for you. Today the average North American has 500% more heavy metals in their body than 100 years ago. Reducing or eliminating heavy metals in your body can greatly improve your overall health. 1. Place 1/2 inch of water into your saucepan. 2. For cast iron pans, aluminum pans, copper pans, stainless steel pans, and glass cookware, scrub the pan vigorously for 30 seconds using stainless steel scouring pad for cookware. 3. For non-stick pans use a plastic scouring pad. 4. Do not use any detergent. 5. Pour the water from each pan into a clear glass. 6. Do you want to drink the water? Doing this test with Vacumatic Surgical Stainless Steel Waterless Cookware will not change the color of the water from before you put it in the pan. Beginning immediately upon receiving your cookware, you will have a Lifetime Factory Warranty which covers workmanship, damages, and flaws in your cookware. The manufacture's customer service address is included with the warranty and placed in the carton with each set, and the actual warranty reads as follows: "This cookware and accessories are guaranteed to the original purchaser for his/her lifetime to be free from defects in materials and workmanship. Return defective piece and it will either be repaired or replaced with the same or an equivalent product and returned to you within 30 days. Handles and knobs are excluded from this warranty. 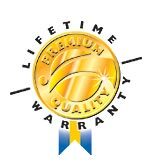 Electrical components of electric skillet have a 5-year warranty.